At this time of year I love to go for a walk through woodlands. It is one of the things that gets me in the right mood for celebrating the season and is the perfect antidote to the crowds and over-commercialisation of the shops before Yule. 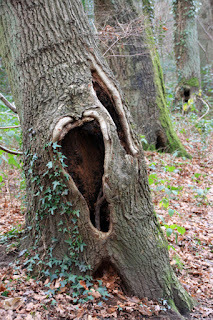 Yesterday I went for a walk in Crofton Woods, in the Borough of Bromley in south-east London. Although I would have liked it to be crisp and cold, with a clear blue sky overhead and frost covering everything in sparkling crystals of ice, it was in fact one of the mildest days on record for London in December. At least that meant I didn't have to wrap up in layers of jumpers and scarves under my coat and my fingers didn't freeze when I took them out of my gloves to snap some photographs. 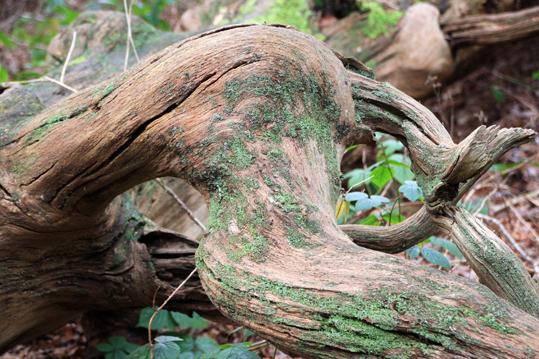 I was particularly fascinated by the number of interesting trees with hollows and twisting fallen logs on the ground. Crofton Woods is Site of Metropolitan Importance for Nature Conservation and a Site of Special Scientific Interest. It is among the largest stretches of woods of this kind in London. 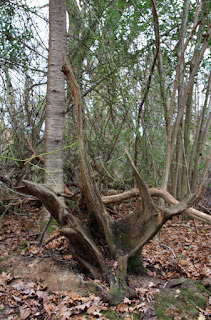 Standing on London clay, it has many different types of trees, shrubs and herbs. Those in the ancient wood are mainly oak and hazel, with a central area that was at one time fields and is now forested over. 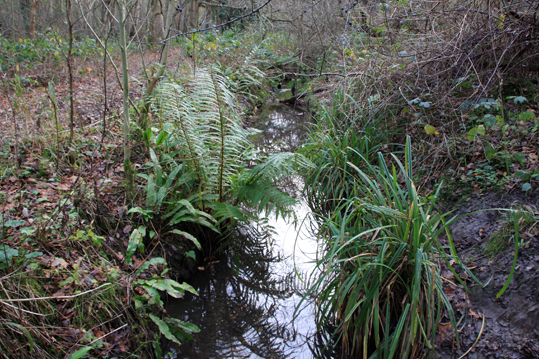 Kyd Brook runs through the woods. A circular walk that you can download from the council website crosses the brook twice and runs along the bank for a while. The London Loop also goes through the area. 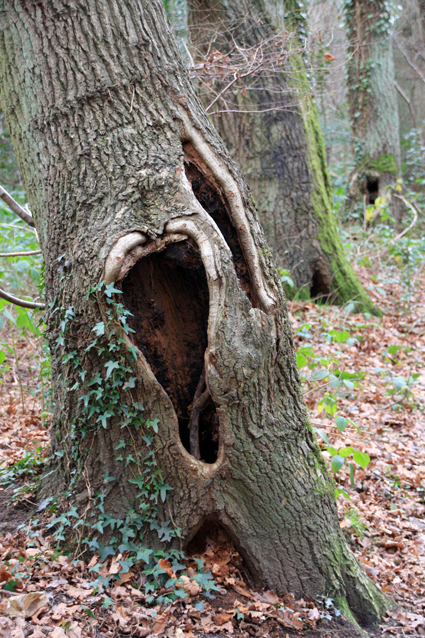 My walk through Crofton Woods let me complete something on my list of New Year resolutions for 2015 - visiting three peaceful wildlife havens within London. It was a very peaceful afternoon - I only saw three other people, who were all out walking dogs. Although I didn't see any rare birds when I was there, the woods are home to woodpeckers, tree creepers and chiff-chaffs. I'm sure plenty of other wildlife can also be found. A sign at the entrance said that fly agaric mushrooms can often be spotted growing near birch trees. Although I looked out for some to photograph, I didn't see any. In spring, I've been told that Crofton Woods is carpeted with bluebells. I love bluebell woods, and that will give me a good reason to come back in a few months time.